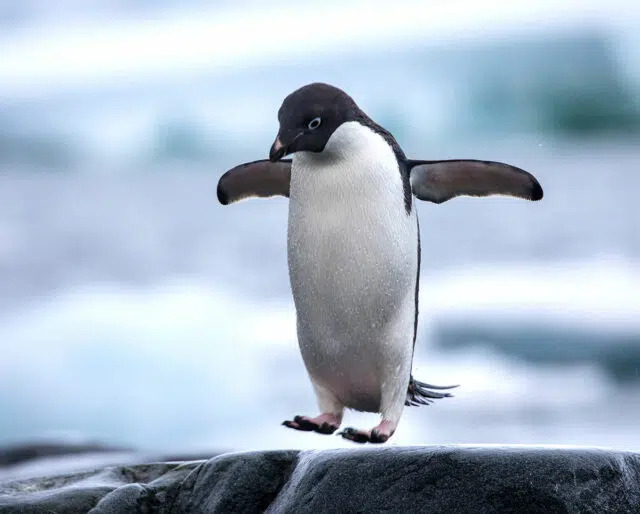 We love penguins for lots of reasons: They walk around in tuxedos, they have a cute waddle, and they’re unique! And to show that we care, we observe National Penguin Day on January 20. While this day celebrates the penguins, it’s also a time to think about saving them. Many penguin colonies have been lost to climate change and it’s estimated that half the population of emperor penguins will vanish by the end of this century. We can start to help these endangered creatures by focusing on environmental issues. The study estimates that by 2100, at least two-thirds of emperor penguin colonies will have dramatically declined. Over a million Adélie penguins were found living off the coast of Antarctica, on the remote Danger Islands. Just 100 miles away in the west Antarctic, the same species is in decline due to sea ice melt. Over two expeditions, Robert F. Scott discovered and investigated the first breeding colony of emperor penguins. This broadened our knowledge about this species. The first person to describe emperor penguins was Johann Reinhold Forster. He had spotted a few during James Cook's voyage. That is, if you're lucky enough to live near a zoo with a penguin exhibit. Try "March of the Penguins 2" — released in early 2018. Kids need to know about this critical environmental issue. When a female emperor penguin's baby dies, she will often "kidnap" an unrelated chick. There are 17 species of penguins and all of them live in the Southern Hemisphere. The penguin species with the highest population is the macaroni penguin with 11 million pairs. The gentoo Penguin is the fastest swimmer — reaching speeds up to 22 mph. An average penguin might spend up to 75 percent of its life in the water — where it also hunts for prey. Whether it's watching a documentary or seeing them for real, we're fascinated with these creatures. This day also sheds light on the plight of the penguins, and teaches us about saving them. One recent study warns that up to 70% of king penguins could be forced to find new places to breed by 2100.